A lot of people celebrates their Christmas Eve with their most special loved ones and family. They prepare their evening with lots of meals and amazing feasts. Having to enjoy their Noche Buena on the night of Christmas Eve, it's been important as part of the Filipino culture here in the Philippines. This Christmas day, Sharon Cuneta and Janice de Belen prepared their home-cooked dishes as part of their traditional Filipino Christmas feast. They roasted some fine turkeys for their families in this special evening. Sharon's daughter, KC Conception, aided in the preparation of their bountiful meals. They had arranged some wine, cheese, fresh fruits, and corns. Sharon's family had a very lovely night as KC made it on time to celebrate their Christmas Eve. She arrived in the Philippines from Paris, France at exactly 2 PM on Dec. 24. Julie Ann San Jose and her family, on the other hand, had a traditional feast by preparing Lechon for their Noche Buena. Judy Ann Santos enjoyed their evening with her mom's home-made "Chicken Ala King." Although some people preferred to stay in the country to celebrate their Christmas, some celebrities went abroad. The family of Manny Pacquaio, the Aquinos and the Alcasids celebrated their Christmas Eve away from their homes. 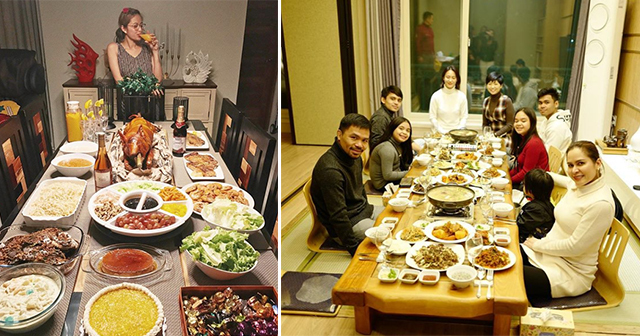 Manny and Jinkee Pacquaio along with their family enjoyed their trip to South Korea and tried their delicacies for their Noche Buena. Kris Aquino and her children traveled to Japan and celebrated their white Christmas. The Alcasid family went to Australia and enjoyed different dishes which is prepared by Ogie's ex-wife, Michelle Van Eimeren, along with her husband, Mark Morrow. It's always fun to celebrate Christmas with your family and loved ones. What are your thoughts about their Christmas Noche Buena? Share it with this article!